X-linked agammaglobulinemia (XLA), or Bruton agammaglobulinemia, is an inherited immunodeficiency disease caused by mutations in the gene coding for Bruton tyrosine kinase (BTK). The disease was first elucidated by Bruton in 1952, for whom the gene is named. BTK is critical to the maturation of pre–B cells to differentiating mature B cells. The BTK gene defect has been mapped to the long arm of the X chromosome at band Xq21.3 to Xq22, spanning 37.5kb with 19 exons forming 659 amino acids to complete the BTK cytosolic tyrosine kinase. A database of BTK mutations (BTKbase: Mutation registry for X-linked agammaglobulinemia) lists 544 mutation entries from 471 unrelated families showing 341 unique molecular events. No single mutation accounts for more than 3% of mutations in patients. In addition to mutations, a number of variants or polymorphisms have been found. See the image below. The Medscape Reference Pediatrics article, Bruton Agammaglobulinemia, also may be of interest. In the absence of BTK, B lymphocytes do not differentiate or mature. Without mature B lymphocytes, antibody-producing plasma cells are also absent. As a consequence, the reticuloendothelial and lymphoid organs in which these cells proliferate, differentiate, and are stored are poorly developed. The spleen, the tonsils, the adenoids, the Peyer patches in the intestines, and the peripheral lymph nodes may all be reduced in size or absent in individuals with X-linked agammaglobulinemia (XLA). BTK is necessary for the proliferation and the differentiation of B lymphocytes. [6, 7, 8] Males with XLA have a total or almost total absence of B lymphocytes and plasma cells. XLA is an inherited disease that occurs in approximately 1 in 250,000 males. Female carriers have no clinical manifestations. Infections begin once transferred maternal immunoglobulin G (IgG) antibodies have been catabolized, typically at about 6 months of age. Early detection and diagnosis is essential to prevent early morbidity and mortality from systemic and pulmonary infections. The diagnosis is confirmed by abnormally low or absent numbers of mature B lymphocytes, as well as low or absent expression of the µ heavy chain on the surface of the lymphocyte. Conversely, T-lymphocyte levels are elevated. The definitive determinant of XLA is the complete absence of BTK ribonucleic acid (RNA) or protein. Specific molecular analysis is made by single-strand confirmation polymorphism (SSCP), direct DNA analysis, denaturing gradient gel electrophoresis, or reverse transcriptase–polymerase chain reaction to search for the BTK mutation. SSCP is also used for prenatal evaluation, which can be performed via chorionic villus sampling or amniocentesis when a mother is known to be a carrier. IgG levels less than 100 mg/dL support the diagnosis. Rarely, the diagnosis is made in adults in their second decade of life. This is thought to be due to a mutation in the protein, rather than a complete absence. The BTK mutations underlying X-linked agammaglobulinemia (XLA) interferes with the development and the function of B lymphocytes and their progeny. 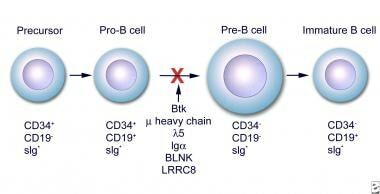 The major block occurs in the development of pro–B cells to pre–B cells and then to mature lymphocytes. Patients can have pre–B cells in the marrow, but they have few, if any, functional (mature) B cells in the peripheral blood and the lymphoid tissues. The estimated frequency of X-linked agammaglobulinemia (XLA) is approximately 1 case per 250,000 population. Two thirds of cases are familial, and one third of cases are believed to arise from new mutations. The incidence of XLA around the world does not vary significantly. Most studies involve Northern European patients. However, no racial predilection for XLA has been established. Bruton agammaglobulinemia is an X-linked disease, with only male offspring being affected. Most cases are inherited, but, rarely, the disease manifests as a consequence of a spontaneous mutation. Mutations in the gene for the heavy mu gene (IGHM), the immunoglobulin-alpha gene, and the lambda-5 gene can cause agammaglobulinemia, with less than 1% CD19 expression on B cells. No female carriers present with the clinical manifestations of the BTK mutation. Male infants become affected by X-linked agammaglobulinemia (XLA) when maternal antibodies decline usually after age 4-6 months. If the mother has been identified as a carrier for the disease, chorionic villi sampling or amniocentesis can be performed to collect fetal lymphocytes in utero. At birth, cord blood samples can be tested for a decrease in CD19+ B cells and for an increase in mature T cells via fluorocytometric analysis. Children typically clinically manifest the disease at age 3-9 months with pneumonia, otitis media, cellulitis, meningitis, osteomyelitis, diarrhea, or sepsis. [9, 10] Rare cases of adults in their second decade have been diagnosed with a milder form XLA thought to be due to a mutation rather than an absence of the protein. IVIG is responsible for increasing survival rates, with treatment beginning preferably before the patient is aged 5 years. Serious enteroviral infections and chronic pulmonary disease are often fatal in adulthood. Most men with X-linked agammaglobulinemia (XLA) live into their 40s. The prognosis is better if treatment is started early, ideally if intravenous immunoglobulin G (IVIG) is started before the individual is aged 5 years. Even with treatment, patients can expect to have chronic pulmonary infections, skin disease, inflammatory bowel disease (ulcerative colitis and Crohn disease), and central nervous system complications due to enteroviral infection. Patients and their families must understand the nature of the disease and the importance of early treatment. Identification and treatment of common infections are necessary for a better prognosis. The Immune Deficiency Foundation is a solid resource for both support and education of patients and their families. The foundation can be reached at 1-800-296-4433. The Jeffery Modell Foundation can be reached at 1-800-JEFF-844. Conley ME, Broides A, Hernandez-Trujillo V, et al. Genetic analysis of patients with defects in early B-cell development. Immunol Rev. 2005 Feb. 203:216-34. [Medline]. Vihinen M, Kwan SP, Lester T, et al. Mutations of the human BTK gene coding for bruton tyrosine kinase in X-linked agammaglobulinemia. Hum Mutat. 1999. 13(4):280-5. [Medline]. Vihinen M, Mattsson PT, Smith CI. Bruton tyrosine kinase (BTK) in X-linked agammaglobulinemia (XLA). Front Biosci. 2000 Dec 1. 5:D917-28. [Medline]. Wang XC, Wang Y, Kanegane H, Toshio M, Yu YH. [Gene diagnosis of X-linked agammaglobulinemia]. Zhonghua Er Ke Za Zhi. 2005 Jun. 43(6):449-52. [Medline]. Wang Y, Kanegane H, Sanal O, et al. Bruton tyrosine kinase gene mutations in Turkish patients with presumed X-linked agammaglobulinemia. Hum Mutat. 2001 Oct. 18(4):356. [Medline]. Khan WN. Regulation of B lymphocyte development and activation by Bruton's tyrosine kinase. Immunol Res. 2001. 23(2-3):147-56. [Medline]. Ng YS, Wardemann H, Chelnis J, Cunningham-Rundles C, Meffre E. Bruton's tyrosine kinase is essential for human B cell tolerance. J Exp Med. 2004 Oct 4. 200(7):927-34. [Medline]. Satterthwaite AB, Witte ON. The role of Bruton's tyrosine kinase in B-cell development and function: a genetic perspective. Immunol Rev. 2000 Jun. 175:120-7. [Medline]. Poizeau F, Droitcourt C, Saillard C, Poirot M, Le Gallou T, Perlat A, et al. [Shifting cellulitis in a patient with X-linked hypogammaglobulinemia]. Ann Dermatol Venereol. 2016 Apr 11. [Medline]. Giorgetti OB, Paolini MV, Oleastro MM, Fernández Romero DS. [X-linked agammaglobulinemia in adults. Clinical evolution]. Medicina (B Aires). 2016. 76 (2):65-70. [Medline]. Chun JK, Lee TJ, Song JW, Linton JA, Kim DS. Analysis of clinical presentations of Bruton disease: a review of 20 years of accumulated data from pediatric patients at Severance Hospital. Yonsei Med J. 2008 Feb 29. 49(1):28-36. [Medline]. Futatani T, Watanabe C, Baba Y, Tsukada S, Ochs HD. Bruton's tyrosine kinase is present in normal platelets and its absence identifies patients with X-linked agammaglobulinaemia and carrier females. Br J Haematol. 2001 Jul. 114(1):141-9. [Medline]. Speletas M, Kanariou M, Kanakoudi-Tsakalidou F, et al. Analysis of Btk mutations in patients with X-linked agammaglobulinaemia (XLA) and determination of carrier status in normal female relatives: a nationwide study of Btk deficiency in Greece. Scand J Immunol. 2001 Sep. 54(3):321-7. [Medline]. Chear CT, Ripen AM, Mohamed SA, Dhaliwal JS. A novel BTK gene mutation creates a de-novo splice site in an X-linked agammaglobulinemia patient. Gene. 2015 Apr 15. 560 (2):245-8. [Medline]. Ariganello P, Angelino G, Scarselli A, Salfa I, Della Corte M, De Matteis A, et al. Relapsing Campylobacter jejuni Systemic Infections in a Child with X-Linked Agammaglobulinemia. Case Rep Pediatr. 2013. 2013:735108. [Medline]. [Full Text]. Fu JL, Shyur SD, Lin HY, Lai YC. X-linked agammaglobulinemia presenting as juvenile chronic arthritis: report of one case. Acta Paediatr Taiwan. 1999 Jul-Aug. 40(4):280-3. [Medline]. Quartier P, Foray S, Casanova JL, Hau-Rainsard I, Blanche S, Fischer A. Enteroviral meningoencephalitis in X-linked agammaglobulinemia: intensive immunoglobulin therapy and sequential viral detection in cerebrospinal fluid by polymerase chain reaction. Pediatr Infect Dis J. 2000 Nov. 19(11):1106-8. [Medline]. Barmettler S, Otani IM, Minhas J, Abraham RS, Chang Y, Dorsey MJ, et al. Gastrointestinal Manifestations in X-linked Agammaglobulinemia. J Clin Immunol. 2017 Apr. 37 (3):287-294. [Medline]. Vu QV, Wada T, Le HT, Le HT, Van Nguyen AT, Osamu O, et al. Clinical and mutational features of Vietnamese children with X-linked agammaglobulinemia. BMC Pediatr. 2014 May 28. 14:129. [Medline]. [Full Text]. Carrillo-Tapia E, García-García E, Herrera-González NE, et al. Delayed diagnosis in X-linked agammaglobulinemia and its relationship to the occurrence of mutations in BTK non-kinase domains. Expert Rev Clin Immunol. 2018 Jan. 14 (1):83-93. [Medline]. Murray PR, Jain A, Uzel G, Ranken R, Ivy C, Blyn LB, et al. Pyoderma gangrenosum-like ulcer in a patient with X-linked agammaglobulinemia: identification of Helicobacter bilis by mass spectrometry analysis. Arch Dermatol. 2010 May. 146(5):523-6. [Medline]. Park JY, Kim YS, Shin DH, Choi JS, Kim KH, Bae YK. Primary cutaneous peripheral T-cell lymphoma in a patient with X-linked agammaglobulinaemia. Br J Dermatol. 2011 Mar. 164(3):677-9. [Medline]. Narula G, Currimbhoy Z. Transient myelodysplastic syndrome in X-linked agammaglobulinemia with a novel Btk mutation. Pediatr Blood Cancer. 2008 Dec. 51(6):826-8. [Medline]. Brosens LA, Tytgat KM, Morsink FH, et al. Multiple colorectal neoplasms in X-linked agammaglobulinemia. Clin Gastroenterol Hepatol. 2008 Jan. 6(1):115-9. [Medline]. Behniafard N, Aghamohammadi A, Abolhassani H, Pourjabbar S, Sabouni F, Rezaei N. Autoimmunity in X-linked agammaglobulinemia: Kawasaki disease and review of the literature. Expert Rev Clin Immunol. 2012 Feb. 8(2):155-9. [Medline]. Sharma D, Guleria S, Suri D, Rawat A, Garg R, Singh S. A child with X-linked agammaglobulinemia and Kawasaki disease: an unusual association. Rheumatol Int. 2017 Apr 1. [Medline]. Qin X, Jiang LP, Tang XM, Wang M, Liu EM, Zhao XD. Clinical features and mutation analysis of X-linked agammaglobulinemia in 20 Chinese patients. World J Pediatr. 2013 Jan 18. [Medline]. Segundo GRS, Nguyen ATV, Thuc HT, Nguyen LNQ, Kobayashi RH, Le HT, et al. Dried Blood Spots, an Affordable Tool to Collect, Ship, and Sequence gDNA from Patients with an X-Linked Agammaglobulinemia Phenotype Residing in a Developing Country. Front Immunol. 2018. 9:289. [Medline]. D'Eufemia P, Nigro G, Celli M, Finocchiaro R, Iannetti P, Giardini O. Low-dosage immunoglobulins for an infant with hypogammaglobulinemia, maple syrup urine disease, and parvovirus B19-associated aplastic crisis. J Pediatr Hematol Oncol. 2000 Sep-Oct. 22(5):485-7. [Medline]. Davey PT, Tan CJ, Gardiner K. The use of infliximab in X-linked agammaglobulinaemia associated enteropathy. Ann R Coll Surg Engl. 2014 Jul. 96(5):e5-6. [Medline]. Hendriks RW, Bredius RG, Pike-Overzet K, Staal FJ. Biology and novel treatment options for XLA, the most common monogenetic immunodeficiency in man. Expert Opin Ther Targets. 2011 Aug. 15(8):1003-21. [Medline]. Bestas B, Turunen JJ, Blomberg KE, Wang Q, Månsson R, El Andaloussi S, et al. Splice-correction strategies for treatment of X-linked agammaglobulinemia. Curr Allergy Asthma Rep. 2015 Mar. 15 (3):510. [Medline]. Lee KH, Shyur SD, Chu SH, Huang LH, Kao YH, Lei WT, et al. Clinical manifestations and BTK gene defect in 4 unrelated Taiwanese families with Bruton's disease. Asian Pac J Allergy Immunol. 2011 Sep. 29(3):260-5. [Medline]. The authors and editors of Medscape Reference gratefully acknowledge the contributions of previous author, Isabel N. Granja Jander, MD, to the development and writing of this article.